Nicholas Hellmuth and FLAAR try out the Imacon Ixpress 528C and document that the Imacon Ixpress 528C is more portable than earlier models. Review Forum for medium format digital camera backs. Our first medium format camera was the Kodak ProBack on a Hasselblad. The output was better than we expected. Now, 2 years later we have moved upscale to the Leaf Valeo 22 and Mamiya 645. Here is Nicholas' portrait of Michelle, one of the capable staff in the FLAAR office: taken with Leaf Valeo 22. You can see more of Michelle in our six free reports that reveal the results of a 90-day initial benchmarking, evaluation, and review of the Leaf Valeo 22 at both universities where FLAAR maintains test studios. "Baby," Jim Trotter's cat. This is the first Hellmuth photo with FLAAR using an Imacon back on a Hasselblad H1 645 medium format digital camera. We thank Jim Trotter for loading the Imacon. His studio is at 12342 Conway Rd , St Louis , MO 63141 , He lives just down the road from the Hellmuth family in Ladue. Presently there is no international forum for reviews and evaluations of medium format cameras. Thus FLAAR serves in the interim as a source of factual information. specifically on medium format digital backs. And even if other forums open up, FLAAR will still offer our Reports, reviews, evaluations and bench marking on medium format digital cameras. The truth is the best advertising you can have. The truth comes out when a reviewer has the product in his or her hands. Our hands-on experience with the Kodak ProBack Plus two years ago was the start of a new round of reviews of medium format digital backs. This follows four years as beta tester for the Dicomed and then BetterLight large format digital cameras. We also are many months into testing the Nikon D100 digital camera. We have taken the 35mm Foveon sensor out on location for testing seven weeks in Malta and an intensive test session in Arizona. FLAAR is a non-profit photography research institute with photo test studios at two universities. You can see our photographs in coffee table art books published in Austria and Japan, as well as leading university and museum presses of the USA. FLAAR is not paid by any camera manufacturer. Reviews of cameras are written by the faculty and staff of the University, who are not paid by any camera manufacturer either. These are the reasons why photographers trust our reviews as compared with pseudo-reviews which are often skillfully crafted PR releases in conjunction with resellers or camera manufacturers. The reason we are honest is because lots of photographers make their decision on what make and model equipment to purchase based on our reviews. So we feel in fairness to them we should report the pros and cons. After our evaluations of the Kodak ProBack Plus, we evaluated the Leaf Valeo 22 with Mamiya 645 AFD on a 6-month initial loan. However our medium format digital camera initiative is intended to grow the market for medium format in general. Thus we are open to evaluating and writing reviews on other makes and models. But since the Leaf is the one we started with, this is obviously the one we used, and as a logical result, the system we write about and picture in photo opportunities. Indeed we have six colorful reports in PDF format showing photo opportunities with the Leaf already. The trend in digital imaging is to save the raw data. Creo was among the first with its oXygen software. Kodak saves raw data and specifically states that you can shoot without fiddling and then fix the color balance and everything else at the end. Imacon now has added a similar software which they call 3F file format. Generally each manufacturer's version has one or two features the others have not yet included. Since Leaf is the 16-bit digital camera that we have, Leaf software is the one we know best. 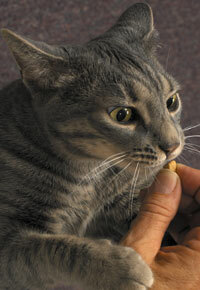 My first use of an Imacon was to photograph "Baby" the cat that loves to pose (when fed). Imacon follows the common feeling that there are multiple advantages of working with raw 16 bit files, even though at the final end the printers of today accept only 8 bits. Just realize that file size, expressed in megabytes, for comparative purposes, are valid only in 8 bit mode, not in 16 bit mode, because no standard printer accepts 16 bit files. But for working the image in Photoshop or RAW mode; yes, you do want 16 bit size. Imacon makes professional quality cameras. The company is a prestige brand. The newest Imacon scanners are improved in both hardware and software aspects over their earlier models. So it is unfortunate that competition drives any company to artificially pump up the specs in order to hope to make their product stand out. We admire a company which is proud of their product, but if the advantages are in less noise or whatever, these are the features which should be featured, not a spurious megabyte count which in end result is non-existent when you come to print the file. If these misleading claims were not repeated, then we would have no issue to raise. What about 4-shot and 16-shot mode on the Imacon Ixpress? Imacon is now has a 4x multi-shot version, following Sinar and Jenoptik who had multi-shot versions earlier. Early this year it was possible to borrow a Hasselblad H1 with an Imacon Ixpress 528C multi-shot back from SSI Digital, courtesy of Lance Shad. During a 6-day period we had a chance to learn the differences between the H1 and the Mamiya 645 AFD. If you are considering buying either of these 645 models you ought first to get your hands on Nicholas Hellmuth's reports on the H1 and on the Mamiya 645 AFD. Using the 4-shot and 16-shot features require massive cache space on your computer. Our 15-inch Titanium laptop was so over-filled with software and files that it could not handle 4-shot and 16-shot mode out on location. Now we have replaced this with a 17-inch Mac Titanium, with ample hard-disk space and 2 GB RAM (max available for a Mac laptop as far as we know). But until we can borrow the Hasselblad Imacon equipment again, we can't comment on the multi-shot capability of the Ixpress. We were curious to see how 4-shot and 16-shot medium format quality compared with using a large-format scanning back. We look forward to testing these professional products in person as part of our program to provide insightful commentary on photographic equipment. FLAAR is increasingly an international source of factual comparative information on digital imaging hardware and software for both professional photographers and pro-sumers. Furthermore, since FLAAR is university-based and associated with the museums on campus, our recommendations increasingly form the basis for decision making by other universities, museums, and photo studios worldwide. So far the students of our course have tended to purchase the cameras that are discussed and pictured in the course, which are naturally the digital cameras which we have selected based on attending trade shows and then trying them out ourselves. Comparative comments on all the other medium format digital backs: Kodak, Jenoptik, Leaf, MegaVision, PhaseOne, Sinar. Here are samples from Jim Trotter's photography. You can see more on his web site, www.colorimageart.com . 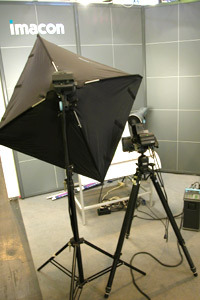 Jim uses the Imacon with a Hasselblad H1 645 camera body. If you wish to accomplish photography of the same quality as Trotter, you might want to consider using the same camera. Indeed you can obtain this camera, including training from the master himself, since Trotter is also a certified Imacon dealer. You can also ask him about wide format printers and other comparable products. Phone: 314-878-0777, Fax: 314-878-7799. The advantage is you get your camera from a practicing and obviously experienced photographer. No salesman is involved: you deal directly with a talented photographer with many decades of professional experience. Most recently updated August 1, 2005. Previously updated March 20 2003 , June 16, 2003 , July 14, 2004 , September 24, 2004.